Tshock is working and up to it's most current setting. Keeping with the spirit of game server Awards i have modified an unused award into the "Almustadt" Veteran. Please post here once you've requested it so that i know when to approve. Regrettably, as of this post VonXeno is relived from the Terraria Manager, per his request. Thank you for your time as Terraria Manager, you have seen terraria continue steady away even after everything else has gone. You are always welcome back as a staff member and your service to HGN is admirable. In-Character / Aetheron, the Corrupted. A Caphori Veteran exiled and banished to the Crimson Waste who has returned with more than he bargained for, slowly being transformed. Strong resistance to Poison and Venom. Time ago a disgraced Caphori Warrior was cast into exile. Magic bound him to a realm of endless Crimson Waste, a death sentence? While most would perish in the Crimson the warrior did not. As his punishment was not death but an eternity of torment and torture, frozen in time. Day by day, hour by hour the warriors hatred for those that bound him there grew, inevitably vengeance became his only driving force. He adopted a militaristic regime of training and discipline, butchering creatures of the Crimson for practice and planning his revenge all above the surface of the terrain. It did not take long for the incomprehensible whispers to began. Something was trying to communicate, in this land of torture and torment, a land walked only by the Warrior. After what seemed like years of non stop whispering, the voices became clearer and louder. The warrior began to understand some phrases, he was being called below the surface, there was something down there calling him. The hidden creature offered him freedom at the cost of the only thing that mattered to him, his ability to enact revenge. He awoke a trembling frame of his former self. Under his skin crawling with moving red beads pulsing in towards the centre of his chest. Panicked he jumped to his feet staring at his trembling arms he noticed the grass around him, this wasn't The Crimson Waste. The Warrior fell back to his knees as a familiar voice began to speak "We are home...". Freedom - but at what cost? This topic has been moved to Lore & Locations. Flash player doesnt work with them though. 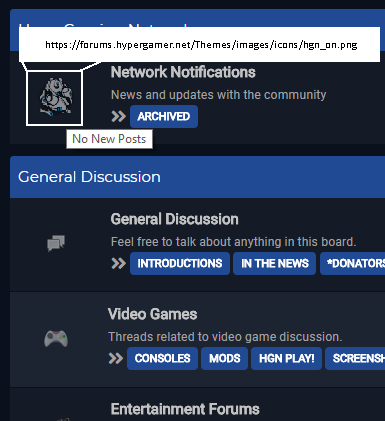 I marked Network notifications as "mark forum read" yet it's still displaying the unread post icon (../hgn_on.png) instead of the read icon (.../hgn_off.png). The rules set here apply to everyone whilst on the forums and in game servers. All of this is Work in Progress, please comment if you feel a rule is wrong or you have one to add. Respect each member as you would wish yourself be respected, be nice and others will be nice back. Any type of Hack, in any form, is against HGNs values. Anyone found using them will be permanently banned without the option to appeal. Purposely trying to invoke reactions out of members. You know who you are. Ties in with Respect, jokes are fine just have some form of filtering; ie. don't go too far. If you're making a 'joke' about a member, its not a joke - that's an insult. Spam and Shitposts will be removed. Your forum account can be restricted to "Moderated Post" meaning each of your post needs verification by a mod before posting. A player is metagaming when they use knowledge that is not available to their character in order to gain advantage, such as knowledge gained Out-of-Character, or the statistics of a Creature/Stranger that the player is familiar with but the character has never encountered. The player may be aware of the set location of specific equipment or secret door, which their character is not aware of. It can also include plot information, such as saying the name of a stranger before it has is revealed. All admins are picked by Community & Server Managers. If a thread is over 6 months old, irreverent or you don't have a good reason to post there, just leave it alone. Where applicable all rules in this list apply, spammers will be shot on sight. You can have your shoutbox removed if you do not comply. Public ERP is forbidden on our game servers. A player can be described as a powergamer if he or she presumes or declares that his or her own action against another player character is successful without giving the other player character the freedom to act on his or her own prerogative. They may also be a player who tries to force others to participate in unwanted role-playing. Yes i know theres no numbers, i'll add them when its organised. As of this post James Almasy/Syndraell is relived from the Terraria Manager & CMT Supervisor roles and names VonXeno as his successor for Terarria. After many years leading he feels it's time to move on and has sadly chosen to resign. He is always welcome back as a staff member and his service to HGN is admirable. You know the command to remove Water/Lava at block level using world edit? Someone has lava-griefed it seems. "It is said by my Elders that Centuries ago, Jarl 'Griffin' Sjölund raided these isle's after being Exiled from his homelands far West. His party raised a large undeveloped settlement rife with gold and exotic stones, foods and women. With such riches and women but no-where to go - Jarl Sjölund ordered his men (and Longboats) ashore to begin intimidate set up on a large hill beside an ancient sealed tower which overlooked the bay. After Settling and sending his Plundered riches and women back to his homeland in an effort repair some relations, Jarl Sjölund ordered that the sealed tower be opened. On opening, he gazed upon a small chamber with a magnificent floor and walls chiselled with now destroyed ancient writings and images. The deeper chamber was still blocked, the writings untranslatable, only the images of a Griffins and a Star Calendar comprehend-able. The Legend says on reaching the top, he was greeted by a Griffin, which formed an instant loyal bond to him. He used this Griffin to wage raids up until the end of the Cycle 8 years later, where Jarl 'Griffin' Sjölund was found dead and turned to stone. Small risk to coastal settlements. Griffin's Landing has since been sold to the Dwarves.